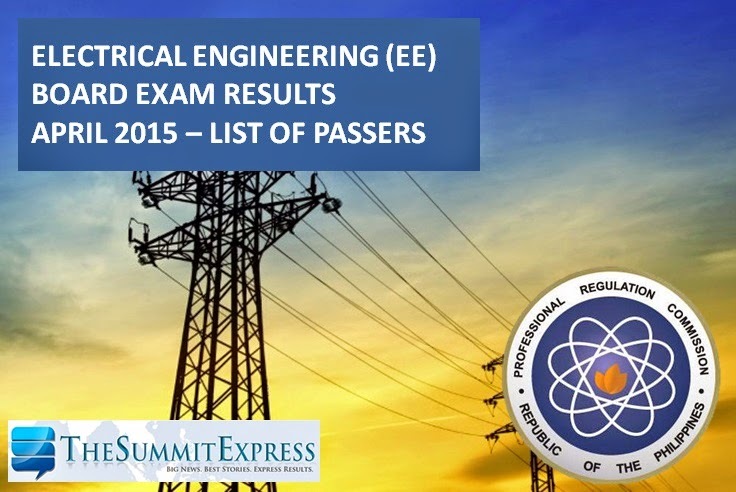 Those awaiting results of April 2015 Registered Electrical Engineers (REE) and Registered Master Electricians (RME) board exam may find here the full results as the Professional Regulation Commission (PRC) and the Board of Electrical Engineering (BEE) announced the alphabetical list of passers, top 10 (topnotchers), top performing school and performance of schools after 2 working days. PRC on Thursday night, April 30 named a total of 884 out of 1,886 REE and 1,134 out of 2,705 RMEs who have successfully passed the Electrical Engineer Licensure Examinations. The BEE composed of Engr. Jaime V. Mendoza and Engr. Francis V. Mapile administered the electrical engineering board exam in the cities of Manila, Baguio, Cagayan de Oro, Cebu, Davao, Iloilo, Legaspi and Lucena on April 26-27 (REE) and April 28 for RME. Registration for the issuance of Professional Identification Card (ID) and Certificate of Registration will be on May 11, 2015 for R. M. E. and May 12 & 13, 2015 for R.E.E. Those who will register are required to bring the following: duly accomplished Oath Form or Panunumpa ng Propesyonal, current Community Tax Certificate (cedula), 1 piece passport size picture (colored with white background and complete name tag), 2 sets of metered documentary stamps and 1 short brown envelope with name and profession and to pay the Initial Registration Fee of P600 and Annual Registration Fee of P450 for 2015-2018 for REGISTERED ELECTRICAL ENGINEER; Initial Registration Fee of P450 and Annual Registration Fee of P420 for 2015-2018 for REGISTERED MASTER ELECTRICIAN. Successful examinees should personally register and sign in the Roster of Registered Professionals. REE board examination covers the following subjects: Mathematics and Engineering Sciences and Allied Subjects (April 26) and Electrical Engineering Professional Subjects (April 27). RME board exam includes the following subjects: technical subjects such as basic electricity, generators, transformers, switches and others and Philippine Electrical Code which includes installation requirements, wiring subjects, electrical safety and others. In September 2014 exams, results were released in three working days after the last day of examinations. PRC named 2,190 out of 3,661 Registered Electrical Engineers and 972 out of 2,964 Registered Master Electricians who have successfully passed the Electrical Engineer Licensure Examinations. In February of last year, a total of 574 out of 1,648 passed the Registered Electrical Engineers and 871 out of 1,973 hurdled the Registered Master Electricians (RME) board exams. Like Us on Facebook or Follow Us on Twitter to receive immediate updates related to electrical engineering licensure examinations. You may subscribe also to our RSS or E-Mail List.